Why choose Niewald Carpet Cleaning? We have been in business since 1991. 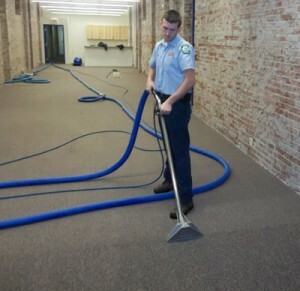 We have formal training and are certified with The Clean Trust. Leading carpet manufacturers recommend using companies for residential and commercial carpet cleaning that are certified with The Clean Trust. Niewald Carpet Cleaning is a service provider for The Carpet and Rug Institute. We have an A+ rating with the Better Business Bureau. Our men are uniformed, friendly and professional. As a family owned and operated company, Niewald Carpet Cleaning will earn your trust with great service at a reasonable price. Leading carpet manufacturers recommend hot water extraction, which is the method we use. Our equipment is mounted inside the vans. We run a vacuum and water hose into your house and after the carpets have been sprayed with a solution to loosen embedded soils and spots, they are brushed. Then we rinse the carpet with hot water to remove soil and solution with a powerful vacuum. Our technicians can clean most area rugs in your home. If the rug is on hardwood or laminate they may put drop clothes around the area rug to protect the floor. We put furniture blankets under the upholstery. Then we inspect and test the upholstery to see what method should be used for cleaning. Most upholstery is safely cleaned with hot water extraction. When the work is finished, upholstery is put back in place with cushions and pillows set up like tee-pees for drying. Our technicians move dining room chairs, sofas, love seats, coffee and end tables, recliners, and some bedroom furniture. Pianos, entertainment centers, china cabinets, large dressers, and chests may not be moved. Moved furniture will be put back in its original space and will have carpet protectors placed under to protect the carpet and furniture. If, for any reason, you are not satisfied with any of the commercial or residential cleaning, we will gladly clean the area again at no charge. Our guarantee is for 45 days from the day the work was done.